Welcome to the phangan.info notice board, where you exchange tips and ideas or search for up to date recommendations from the team here or other travellers. The most recent 50 messages are displayed. Visitors can search through past threads according to a topic. I AM COMING ON 25TH DEC FOR FULL OR HALF MOON PARTY. I AM CONFUSED, LOOKING AT VARIOUS SITES I AM NOT SURE IF THE PARTY IS A FULL OR HALF MOON ONE? SOME SITES SAY IT'S S FULL MON PARTY, OTHERS SAY HALF MOON. THE WORST EXPERIENCE OF MY LIFE !!! ALL THE WORST SITUATIONS CAN HAPPEN IN A HOTEL, CONCENTRATE ON THIS. ITS A VERY COOL PLACE TO CHILL OUT :) YOU MEET SOME VERY INTERESTING PEOPLE HERE, MY PARTNER AND I HAVE BEEN HERE MANY MANY TIMES, WE HAVE BEEN COMING BACK HERE EVER YEAR FOR THE LAST 5... ITS A GREAT PLACE. I HAVE BEEN THERE. FIRSTLY, I DECIDED TO COME HERE BECAUSE I LIKE SWIMMING, I ALWAYS CHOOSE THE HOTELS WITH SWIMMING POOL. ANOTHER CONDITION IS ATMOSPHERE AND LOCATION. I THINK THIS PLACE IS OK AND LET ME SAY THAT THAI FOOD HERE IS VERY DELICIOUS. IT'S MY VERY GOOD CHOICE. I WANT TO GO BACK TO PHANGAN ISLAND AGAIN! I HAVEN'T ENJOYED THE SEA YET THIS SUMMER. STILL HAVEN'T PUT ON BIKINI EITHER. I FOUND A HOTEL TO MY TASTE. I'M OK WITH ITS PRICE, ATMOSPHERE AND ACTIVITIES (ESPECIALLY THE INFINITE-EDGE SWIMMING POOL). AS SOON AS I FIX THE DATE, I WILL BOOK THE TICKETS TO GET THERE. PHANGAN BAYSHORE RESORT AND SPA ON PROMOTION HAS GOT ME, IT'S VERY REASONABLE AND WORTH FOR! WE STAYED THERE BETWEEN XMAS AND JUST AFTER NYE 2012 AND HAD A WONDERFUL TIME. MIKE AND HIS STAFF WAS VERY FRIENDLY TO US AND WE HAD A LAUGH EVERY DAY. WE HEARD HE WAS A TOUGH GUY WHICH YOU SHOULDN'T ARGUE WITH... BUT WE HAD A BLAST. HE OCCASIONALLY MADE US LOCAL FOODS WHICH WEREN'T ON THE MENU AND WE WERE ALLOWED TO PLAY OUR OWN MUSIC AND LIGHT OUR OWN FIREWORKS. COLD CHANGS AND BEST PHAD THAI SEAFOOD IS HAD, BEST TREAT EVERY MORNING! MAD MIKE I'M COMING BACK SOON! A VERY NICE PLACE INDEED! I STAYED FOR 2 WEEKS. THE BUNGALOWS HAVE A GREAT VIEW ON THE OCEAN. THE RESORT IS A BIT OFF THE MAINROAD AND IS VERY QUIET, WHICH FOR ME IS A BIG PLUS. THE FAMILY WHICH IS RUNNING THE RESORT IS VERY SWEET AND FRIENDLY, VERY WELCOMING. I BEEN IN KO PHANGAN THREE TIMES TWO YEARS. . TERRIBLE SERVISE, HIGH PRICE, NO GOOD PLACE, A LOT OF NOISE OF CARS AND VERY NEAR ELECTRIC LINE. ONE DAY L SLEEP ON STREET 7 HOURS, BECAUSE ALL STAFF GO OUT OF RESORT WITH KEY OF MY ROOM...AND MUST WAIT ALL NIGHT AND MORNING, WHEN THEY COME BACK..... I DON'T RECOMMEND THIS RESORT ANYBODY. .. BE CAREFUL WITH THIS RESOTS!!!!!!! IF YOU ARE ON THE WEST SIDE OF THE ISLAND WE SUGGEST TO VISIT DRAGON HUT!!! HAVE YOU EVER TASTED A BANANA BRANDY? VISIT US IN BAN TAI AND HAVE A TASTE! MADE HERE, USING LOCAL FRUITS! MORE INFO ON FACEBOOK/KOH SPIRIT BE SPIRITED! THIS IS THE MOST WONDERFUL PLACE! THE BUNGALOWS MADE OF WOOD ARE CHARMING AND THE PORCH IS GREAT FOR WATCHING THE SUNRISE AND SUNSET OVER THE SEA. AFTER VISITING THE WHOLE KHO PANGHAN ISLAND, THE BEST PLACE I ENJOYED MOST IS "COOKIES SALAD" MY FAVORITE DISHES TOO! A SECLUDED PARADISIAC BEACH WITH TURQOISE DELIGHTFUL SWIMS AND WHITE SANDS, GREAT RESTAURANTS AND THE BEST MASSAGES I HAD FROM WHOLE THAILLAND. HELLO WOW, YAI, TOY, SAW & TO ME THE DOG! HI!! ANYBODY HEADING TO KOH PHANGAN IN DEC FOR NEW YEAR PARTY? IM FROM SINGAPORE. I'LL BE GOING THERE WITH 5 OF MY MATES. GUYS AND GIRLS.BEEN 5STRAIGHT YEARS CELEBRATING THERE. LOOKING FOR NEW FRIENDS TO GATHER AND HAVE FUN! HI GUYS, I WILL BE TRAVELING TO THAILAND AT THE END OF THE YEAR/START OF NEXT, WELL 28TH DEC TO 14TH JAN TO BE EXACT. I'M THINKING OF COMING TO KP ON 10TH OCTOBER, BUT I'M NOT TOO SURE IF THE WEATHER WILL BE CONSTANT RAIN. CAN ANYONE ADVISE IF THERE IS MINIMAL RAIN AND SOME SUNSHINE? THANK YOU! I WILL HAVE A CHANCE TO COME THERE ON THE 29TH OF MAY AND STAY TO THE 8TH. I KNOW THERE ARE NO FULL MOON, HALF MOON OR BLACK MOON PARTIES ADVERTISED FOR THAT WEEK, SO I WAS WONDERING IF ANYONE KNOWS HOW THE NIGHTLIFE IS NORMALLY, WHEN THERE ARE NO MAJOR PARTIES. STILL WORTH CHECKING OUT? THANKS A LOT!! WE STAYED HERE LAST YEAR AND ARE HOPING TO RETURN NEXT MONTH. THE RESORT IS LOVELY ,THE ROOMS ARE CLEANED DAILY AND SO IS THE BEACH. SO ITS ALWAYS WHITE SANDS. HI ALL, I'M SANDRA, FROMPORTUGAL, TRAVELLING TO THAILAND AND VIIETNAM ON MY OWN FOR NOW IN FEB. 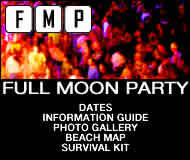 ANYONE WANNA JOIN ME FOR THE FULL MOON PARTY? OR VIETNAM FROM THE 3RD TO 13TH! JUST WANT TO THANK YOU AND YOUR STAFF AT MILKY BAY FOR SOME WONDERFUL TIME. I HAVE JUST FOUND OUT THAT MARK OF THE DIVE INN IN CHALOKLUM, DIED EARLIER THIS YEAR. I USED TO KNOW THIS GUY WELL AND USED TO GO TO HIS BAR A LOT. MY TRIP TO KOH PHANGAN WAS AMAZING AND PART OF THE REASON WAS THE GREAT STAY I HAD AT THE STONE HILL. THE BUNGALOWS ARE BEAUTIFUL AND YOU FEEL LIKE YOU ARE THE ONLY ONE THERE. THE BAR IS PERFECT WITH GREAT FOOD AND EVERYTHING ELSE TO MAKE YOU FEEL CHILL. THE VIEW IS PERFECT. YOU CAN STAY AT CHEAPER PLACES BUT FOR A LITTLE EXTRA THIS PLACE IS GREAT. I'LL BE BACK TO SEE IAN AND PAULA FOR SURE. 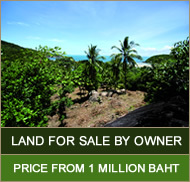 I ARRIVE IN KOH SAMUI THURSDAY P.M APPROX 10. ARE THERE ANY HIGH SPEED BOATS THAT LATE AT NIGHT TO BRING ME TO KOH PANGHAN SINCE THERE IS A MINIMUM 3 NIGHT STAY, AND RATHER MAXIMISE MY STAY AT FMP. THANKS, LOOK FORWARD!!! GOOD DAY TO YOU ALL. IM FROM MALAYSIA AND PLANNING TO CELEBRATE NYE'08 AT PHANGAN ISLAND, ITS MY 1ST TIME GOING THERE. IM HAVING TROUBLE IN FINDING CHEAP HOTELS/ ACCOMODATION THRU THE INTERNET- JUST WANT TO ASK ANYONE HERE CAN PROVIDE ME LITTLE TIPS ABOUT AFFORDABLE ACCOMODATION- LET SAY ABT USD5 PER NITE?? ..AND OH YA, I'LL BE TRAVELLING WITH MY FRIEND- SO ANYONE IS ENCOURAGE TO JOIN US..
MY GF AND I ARE PLANNING TO ARRIVE TO PHANGAN THIS SATURDAY. BEEN THERE 2 YEARS AGO, SAME DATES. HAD GORGEOUS WEATHER - A COUPLE OF RAINS HERE AND THERE, DIDN'T FEEL MISERABLE AT ALL. NOW I AM READING THE NEXT 2 WEEKS FORECAST WITH ALL THIS "SCATTERED T-STORM" AND 60% PRECIPITATION CHANCE SOLIDLY FOR THE WHOLE FORESEEABLE 10 DAYS. TELL ME, WHAT'S YOUR TAKE ON THAT? WILL WE SPEND ALL DAYS SOGGY OR THAT'S LARRY DAVID'S WEATHERMAN DOING TRICKS TO US? I'D HATE TO DIVERT TO PATTAYA. THANKS! A VERY NICE RESORT OWNED BY SUCH A NICE YOUNG FAMILY. JUST OPEN FOR TWO MONTHS AND ALREADY SO GOOD ORGANISED AND READY! IF ANYONE KNOWS OF JEFF RIMMER ( AN AUSSIE) PLEASE LET ME KNOW AS I WANT TO CATCH UP WITH HIM WHEN I GO TO PHUKET NEXT WEEK. I AM A RELATIVE OF HIS FROM CAIRNS AUSTRALIA. MARILYN. HI I AM VIITING PHUKET SOON AND WAS HOPING SOMEONE WOULD KNOW WHERE I CAN FIND JEFF RIMMER, A RELATIVE OF MINE FROM AUSTRALIA WHI NOW LIVES IN PHANGAN. WE SPENT 10 WONDERFUL DAYS AT SUNSET COVE IN JULY/AUG 07. THE STAFF ARE ALWAYS INCREDIBLY HELPFUL AND FRIENDLY, GOING OUT OF THEIR WAY TO ENSURE THAT YOU ARE HAPPY & COMFORTABLE. MY FRIEND HAD A SCOOTER ACCIDENT WHIST WE WERE ON PHANGAN WHICH REQUIRED THRICE DAILY VISITS TO THE CLINIC IN THONG SALA FOR 4 DAYS. THE MANAGER OF SUNSET COVE HAPPILY DROVE HIM THERE & BACK FOR NO EXTRA CHARGE (12 TRIPS !). THE ROOMS ARE LARGE, SPOTLESSLY CLEAN AND TASTEFULLY DESIGNED - WE'LL BE BACK ! A REAL GEM OF A PLACE, COMFORTABLE BUNGALOWS A GOOD SELECTION OF FOOD AND DRINK AND 30SECONDS FROM THE BEACH. FRIENDS WERE AT HAD KHOM IN DEC/JAN 2007 AND SAID THERE WAS SEA LICE IN THE WATER. DOES ANYONE KNOW WHEN AND WHERE SEA LICE OCCURS IN PHANGAN? WE ARE TRAVELLING TO HAD RIN EAST AND THONG NAI PAN IN AUGUST. HE IS SOUTH AFRICAN AND WAS A DIVE INSTRUCTOR IN HAD RIN ABOUT 7 YEARS AGO. I WAS A MOTHER OF A 3 YEAR BOY AND WE USED TO HANG OUT BUT SINCE LOST CONTACT WITH HIM. DOES ANYONE KNOW HIS CONTACT DETAILS?? HI, I AM LOOKING FOR THE PHONE NUMBER AND OR CONTACT DETAILS FOR 'BOTTLE BEACH 1'. I'M UNSURE IF IT'S 1 OR 2 BUT THE OWNERS NAMES ARE 'CHAI AND NUUT' AND THEY HAVE A 9 YEAR OLD SON 'BEACH'. PAPPA CHAI USUALLY DRIVES THE LONG BOAT. IF ANYONE CAN HELP IT WOULD BE APPRECIATED!!! FOR ME THE BEST PLACE TO BE ON KOH PHANGAN FOR ALL TRAVELERS ON THE WORLD, THERE NOT WILL BE A WARM WATER SHOWER OR LUXURY BATHROOMS. EVERY EVENING YOU CAN FOLLOW THE SUNSET FROM THE RESTAURANT AND ENJOY A BEAUTYFUL DINER. THE FOOD IS GREAT AND ALL PEOPLE ARROUND YOU GIVE YOU EVERYTIME A SMILE. Visitors are reminded that to participate in the discussion forum they must become registered members of the phangan.info website, which incorporates acknowledgement of the website disclaimer and acceptance of the terms and conditions of the discussion forum. To view the discussion forum terms and conditions click here. To view the general website disclaimer click here.